“I can’t tell you how much fun we’re having!” said Paul Cassidy, the Brodsky Quartet’s viola player. 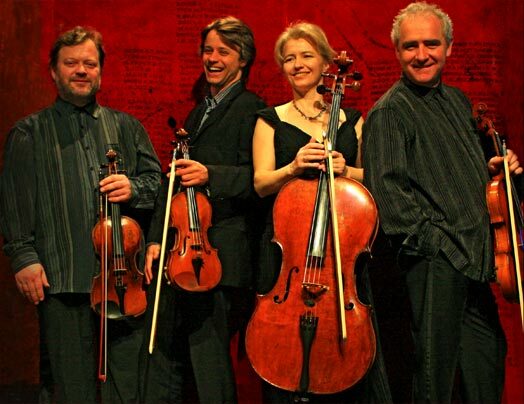 This Kings Place concert (13 October 2016) came under the Baroque Unwrapped umbrella, the Brodsky Quartet and counter-tenor David Hansen were exploring typical and untypical counter-tenor repertoire alongside string-quartet fare with music by Purcell, Handel, Bach, Pergolesi, Respighi, Goosens, Paweł Szymański, and Roxanna Panufnik. With the Brodskys one gets the feeling that everything they do is fun – even after 40-odd years. David Hansen is a Norway-based Australian with a gorgeous creamy, flexible voice, a wide, even range and solid technique. He started with two slow counter-tenor numbers: Purcell’s Music for a while (with rather a lot of l’s in “shallllll allll” (your cares beguile) and an aria from Handel’s Hercules. In both cases diction was less than clear – whether this was because he was singing at modern pitch and slightly higher than usual, I couldn’t say but, though the sound was glorious, I would have liked to be reminded what he was singing about. The quartet then gave us some Bach as a preface to one movement of a piece written by Roxanna Panufnik in memory of her father. O tu, Andrzej had echoes of Geusaldo and was mesmerisingly still, and I for one am dying to hear the other movement now. Respighi is another composer who incorporated music of the past into his 20th-century writing. Il tramonto, written in 1914, was based on a Shelley poem. We are used to hearing it sung by a mezzo-soprano. The Quartet provided luxurious romantic vibrato. Hansen sounded great but he gave no sense he was telling us a story (or even singing in Italian). It was too dark to read the text in the printed programme, so we had to watch his gesticulations that alas gave the game away: this is a hard piece and he didn’t really feel at home in it. After the interval we had more 20th-century music inspired by early texts: for Goossens’ Three Songs Op 26 the poets were from the 16th Century, very varied, with the melancholy ‘And wilt thou leave me thus?’ to the jaunty ‘Philomel’, ode to a nightingale in the Merry Month of May. The Brodskys prefaced the Szymański Five Pieces for String Quartet (of which we heard four) with Purcell’s F major Fantasia – to show how modern Purcell is. The Szymański shows the limits of what a string quartet can do; there are baroque echoes in the writing as well as incredible effects, such as the spooky third movement where, as Cassidy said, “it’s all harmonics and no real notes” – someone walking over a grave. This was a terrific piece and fascinating when segue’d from the Purcell. The official programme ended with Pergolesi’s cantata Orfeo – a real counter-tenor showpiece, enjoyed by all on stage and off (give or take a few niggles about Italian diction on my part). We then had a ‘prayer’ from Bach that morphed into Dido’s ‘Lament’. Then a medley as the second encore: a jolly folksy duet between Hansen and Cassidy; then Prince’s ‘You don’t have to be rich’ complete with purple lighting, as a “tribute to a falsettist lost to us earlier this year”. And finally Grieg’s ‘Jeg elsker dig’, from Hansen’s adopted homeland – ‘I love you’, schmaltzy as you like and not a dry eye in the house.